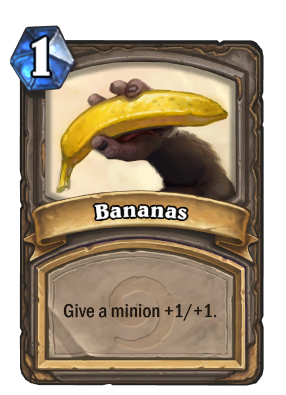 Battlecry: Give your opponent 2 Bananas. Good Old Mukla. Helping me to mill combo decks, October 2018. I've crafted a gold one in loving memory of Harambe. 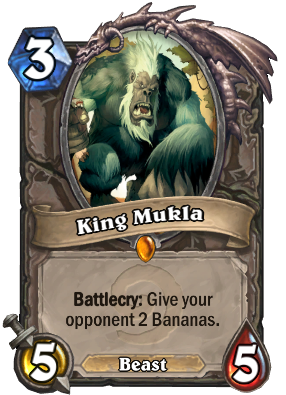 King Mukla with a mix of Brann Bronzebeard, Shadowstep, Shadowcaster, Youthful Brewmaster, Vanish could do wonders to the opponent's hand (like, filling their hand to 10 with bananas and burning subsequent card draws, which are presumably more dangerous than bananas). And, as others already mentioned, he is a good tempo swing, especially during early game, since the opponent must spend mana on bananas to actually equalise stats on board while you already get a strong body. Plus, he's a beast. Yes, bananas on their own are decent and cheap spells, not to be given away too easily. Just opened one. Should I dust it when standard comes? After months of trying to use him, mainly in midrange hunter, I finally dusted him... I loved the card but it created more problems than the 5/5 3 mana beast it presented. I really needed the dust, plus Hunter is not that appealing to me anymore, plus I didn't want having an extra reason to worry for negating the use of the bananas (through for example a successful Freezing Trap) or for playing him at the late game and seeing the bananas trigger Rogue combos, Antonidas fireballs, small minion buffs or tempo mage damage. I also never played mill of any kind, and normally don't expect to. Has anyone tried this in a deck with things like Troggzor the Earthinator? If your opponent uses the bananas they buff your Troggs. This can combo well with Paladin's Divine Favor, most games they can't remove it. There are exceptions like Hunter's Deadly Shot, but an early start to a lot of face hits with a charge flavored deck. The math says if they don't have a 3/2 on the board there isn't much they can usually do to remove it. They typically can't play a minion and the bananas on the next turn, and a charge would sometimes require a coin (Warriors). second turn: coin + mukla, give your opponent a big prize!! !